Fire again in the Sama Reserve! Illegal settlers promote these fires, country-wide, they have NO respect to our biodiversity, they laugh at our laws and enforcement agencies. This government has done nothing to prevent these illegal activity from happening. It is an outrage and our biodiversity suffers and certainly our people in the future! Although the reasons were not officially confirmed, it is observed that once again illegal farming operations were carried out in the Tarijeña reserve of Sama, which has burned down since the weekend. The Emergency Operations Center (COE) has mobilized more than 300 people, all trained in emergency management to control the fire in Sama, South Pines area. In addition, volunteers from surrounding communities joined these works to guide firefighters, police officers and officials from the mountainous terrain to the fire, according to the digital Voice of Tarija. 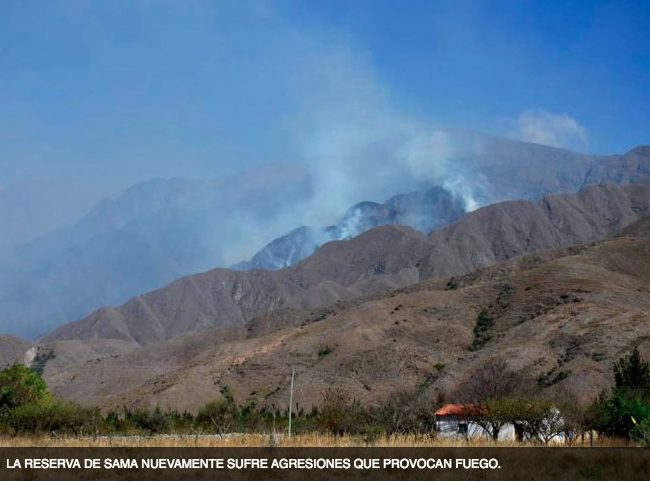 The mayor of Tarija Rodrigo Paz stressed the rapid action of all contingents of emergencies, because although the fire is very large and the winds make this a titanic task, the procedures to achieve control have been more agile compared to the last year’s fire. This entry was posted in Bolivia, Environment, Health, Social Unrest and tagged environmental damage, government failures, illegal settlers, Tarija, uncontrolled fires. Bookmark the permalink.